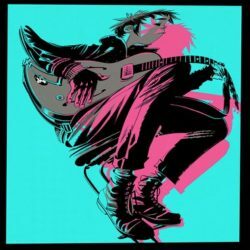 The Now Now is 11 all-new songs from the world’s most successful virtual act, produced by Gorillaz, with James Ford and Remi Kabaka, and recorded in London, in February this year. The album sessions for The Now Now saw the band largely eschewing guest stars, taking it back to the core creative crew: blue-haired, sweet-natured dreamer 2D on vocals; whip-smart Japanese badass Noodle on guitar; not forgetting Brooklyn-born philosopher and the meat–behind-the-beat Russel Hobbs on drums. And with Murdoc Niccals temporarily indisposed, bass duties on the new album have been taken up by erstwhile Gangreen Gang member Ace.